The fitness band ecosystem is already cluttered with a variety of options but Garmin has decided to add yet another of their Vivofit trackers to the crowd. The company has today announced the Vivofit 4 activity tracker, an iterative upgrade over their previous offering. The Vivofit 4 is available on Amazon in the US at a price of $79.99. It brings along a sleek and lightweight 24×7 wearable design, new always-on colour display, coupled with the promise of a year-long battery life. Garmin is still relying on single-use coin cells to provide you continuous activity tracking but has decided to sacrifice the monochrome display to appear more trendy to its consumers. The Vivofit 4 is also water resistant, so you don’t even need to remove it in the shower or pool. Garmin has essentially induced cosmetic changes to their latest Vivofit fitness band and is using its reliable ‘Move IQ’ technology to automatically tracks user’s activity. It is able to detect changes in the user’s movement and classify them in various activities such as walking, biking, swimming and more. An activity tracker is only as effective as how often you wear it, and this is where the vívofit 4 really shines – you can set it and forget it. It’s the ideal device for customers who want something reliable that they don’t need to hassle with or take off to recharge. The Vivofit 4 is ready-to-use the moment you take it out of the box. You can simply place the fitness tracker on your wrist, connect it to the companion Garmin Connect app (available both on Android and iOS) to track your progress in real-time. This app will come in handy not only for at-a-glance info of your important stats, but for watch-faces, themes, and personalized message customizability as well. You also get many aesthetically pleasing band choices to further personalize the fitness tracker as per your comfort. The fitness band ecosystem is unquestionably more popular than smartwatches, which are struggling to find its way to users. 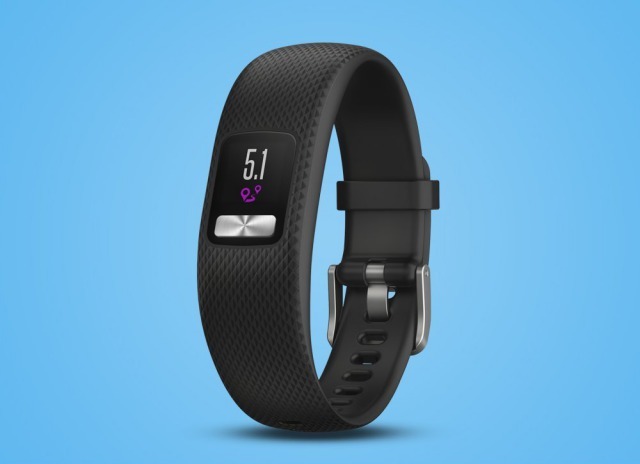 Such lightweight bands are cheaper and appeal more to the fitness frenzy crowd and Garmin is still attempting to entice them with the Vivofit 4. So, if your New Year’s resolution is to focus on your health, Vivofit 4 is quite a decent pick. The best part being that the fitness tracker is already available on Amazon. What are your thoughts on the same? Do let us know your opinions in the comments section down below.